The Genesis Solar Energy Project, a large-scale solar power plant that feeds electricity into the grid, is one of the largest solar plants in the world. Utility-scale solar is fairly common in the US and in fact, there are more than 4,000 solar installations in the US that are over 1 megawatt (MW) in size (compared to the average residential solar system of 5 kilowatts). These large-scale plants can be owned by the utility or a third-party that utility agrees to purchase the electricity from (similar to a residential net metering agreement). Of these large installations, the vast majority are composed of PV panels. The Genesis plant, however, is concentrated solar power, or CSP, which accounts for 10% of these large installations. CSP is an innovative take on thermal solar power which has been mired in controversy over the last few years. Let’s look a bit more closely at the Genesis Solar Project in southern California. From its initial inception and even still today, it has been plagued by environmental and cultural issues. The project raises intriguing questions on the inherent value of solar. Let’s look into what CSP is, how it works, and what the benefits (and drawbacks) are, and why it is so controversial. Concentrated solar power is a type of thermal solar. Unlike PV, which uses light-sensitive silicon or a similar element to convert sunlight into electricity, thermal solar allows sunlight to heat fluid. Back in the 1980s, local governments in portions of the US provided large financial incentives to homeowners who installed thermal solar panels on their roofs. Today you can still see them, heating up fluid which is piped to their water heater, preheating their water supply. In the last decade, thermal solar for homes has suffered at the popularity of PV solar. It’s now more economical to install PV solar to run your water heater than to install thermal solar. With CSP though, thermal solar is still going strong. These large-scale power plants are composed of thousands of computer-controlled mirrors that heat fluid which, in turn, heats water to turn into steam. The steam then runs a very large turbine to produce electricity. There are a couple different set-ups for CSP. The Genesis Solar Project uses parabolic troughs that are composed of long rows of mirrors that look like long half-pipes. Down the middle of the trough runs a fluid-containing pipe, which heats up as the mirrors concentrate sunlight onto the pipe. The fluid is then piped to another area, where it heats the water, creating steam, which propels the turbine. The southwestern United States lays claim to the five largest CSP plants in the world, of which Genesis is fifth. 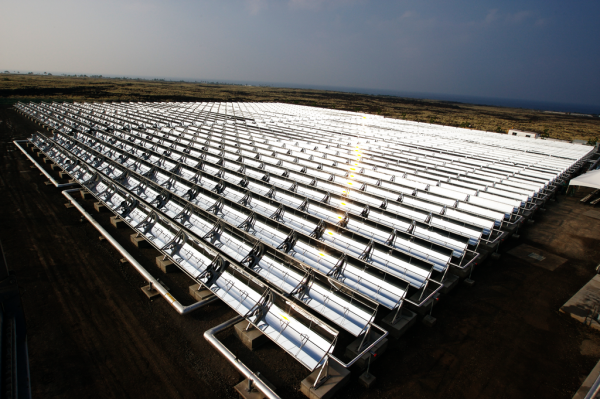 A parabolic trough CSP plant in Hawaii. Note the pipe running through each trough. Source: Xklaim via Wikimedia Commons. Creative Commons License. The nearby Ivanpah Solar Power Facility, the single largest CSP plant, is the only plant in the top 5 that uses a different form of CSP known as a solar power tower. With this method, there is a singular tower surrounded by a circle of mirrors, which reflects and concentrates light up to fluid in the tower, which then heats water just like parabolic troughs. Sound fairly complicated? Well, it kind of is. The Ivanpah plant has failed to live up to the production guarantee its builders made to Pacific Gas & Electric, the Californian utility that agreed to purchase the power. In 2016, the mirrors failed to properly track the sun, causing a fire in the central towers. Due to these issues, state regulators are contemplating dissolving the contract with PG&E, which would effectively close down the plant. So, why would a utility choose to build a plant using CSP instead of PV solar, a much more proven technology? With PV solar currently at about half the price, what’s the benefit of CSP? First, it’s easier to pair CSP with an existing power plant, providing a secondary power source. In addition, it’s easier and more economical to store energy for later use with CSP than with PV, making it potentially more versatile in the long run than PV. The Genesis plant is located on 1,950 acres of public land in the Sonoran Desert, about 200 miles outside of Los Angeles, which is managed by the Bureau of Land Management. With an average temperature of 110 degrees F in July, the area sees high solar irradiance, making it a prime location for solar. In fact, there are numerous large-scale solar power plants in the nearby area. The plant consists of two independent 125 gigawatt (GW) generating facilities, for a total of 250 GW, and employees about 50 full-time individuals. The plant uses over 600,000 mirrors manufactured by Flabeg, a leader in CSP mirror technology who has produced almost 7 million CSP mirrors since the 1980s. The mirrors heat the pipes running through the troughs to 750 degrees. Inside the pipes is an ultra-high temperature synthetic heat-transfer fluid manufactured by Therminol. The plant is estimated to produce 700 megawatt-hours of electricity annually – enough electricity to power about 88,000 homes. In the latter half of 2014, after the plant was up and running at full capacity, the plant produced 576, 113 megawatt-hours. In 2015, it produced 621,454 mWh – somewhat lower than the original estimate, though not by much. The electricity from the plant is purchased by Pacific Gas & Electric, which signed a 25-year power purchase agreement with the Genesis Solar Plant which is on track to produce 65% of all their power from renewable sources by 2020. According to a fact sheet from the plant’s developer NextEra, the plant avoids 330,000 tons of CO2 emissions (when compared to if the same amount of electricity had been produced at a conventional fossil-fuel plant). The plant uses water sourced from on-site wells for equipment cooling, washing the mirrors, and other industrial processes. In 2009, the federal government chose the Genesis project, as well as 22 other high-profile renewable energy projects to “fast track” through the approval process so as to qualify for federal financial incentives, which had a fast approaching deadline. In fact, NextEra secured $1.2 billion in investment for the project, of which $852 million was a loan from Credit Suisse that was partially guaranteed (80%) by the US Department of Energy (DOE), meaning that if NextEra ever defaults on the loan, it becomes the DOE’s responsibility. The federal approval process typically includes environmental reviews that look at how projects affect local water use, wildlife, and cultural resources. While local tribes voiced concern that fast tracking these projects wouldn’t provide them enough time to assess potential issues to their tribe and land, the processes moved along and no red flags were found during the approval process. The issues had yet to begin though. During construction, while earth movers dug out the ground, over 3,000 artifacts were found on the site, including hundreds of metates (grinding stones), hammer stones, projectile points, and scrapers. The artifacts were found on a small portion of the site, so local tribes requested that developers stop construction in the 125 acres. However, NextEra decided it was too expensive to change the development plan and construction continued to move forward. In the end, the only site left undisturbed was a small rectangular area with charcoal and grinding stones, which is thought to have a cremation site. As amends for building on top of the archaeological site, NextEra was required to spend $3 million dollars on ethnographic research of the local area and educational scholarships for Native American students, including the Ford Dry Lake Scholarship Program, which provides funding for post-secondary education to 11 tribes located in California and Arizona. However, the controversy didn’t stop there. 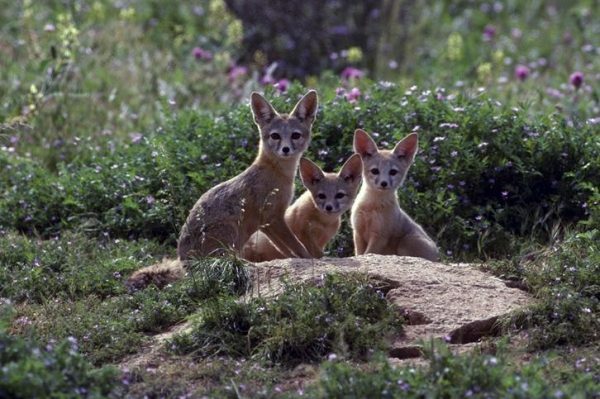 Development was also plagued by resident kit foxes that previously lived in the area to be developed. Initially, to encourage the foxes to leave the area, developers removed the native animal’s food sources, sprinkled coyote urine (a predator of the kit fox) over the ground, and dug out 20 dens in the area. After finding several carcasses at the site, some began to worry and sent out of one of the bodies for examination. They found that the animal died from distemper, a contagious illness with no known cure, possibly brought on because of a weakened immune system due to stress from habitat loss. In the end, 7 of these foxes died during construction. State wildlife workers are now trying to assess if this illness is spreading in the area. In the meantime, electric fences have been installed around the site’s perimeter to discourage the foxes from reentering. By 2014, the plant was complete and producing electricity. Even today, though, one environmental issue still plagues the project – namely birds. 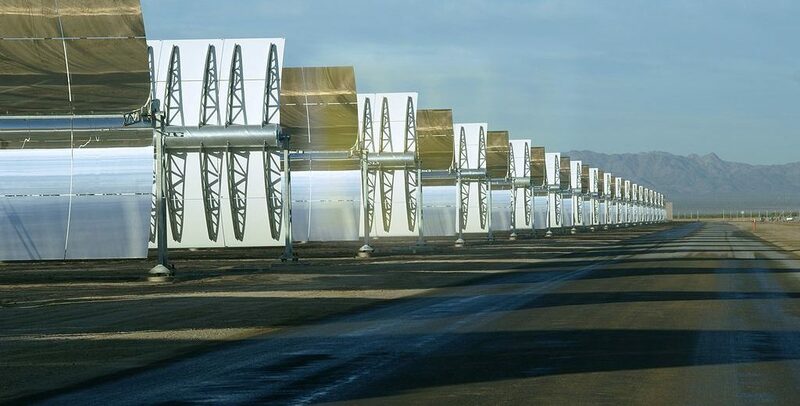 CSP plants have ultra-heated areas between mirrors known as “solar flux”. Through the southwest, many birds have died when they were flying through this ultra-hot area. This is a more serious issue with CSP plants that use power towers (like Ivanpah), as the heated area is quite large and bugs are attracted to the very bright tower, which then draws in birds. Sadly, when the birds fly through the area between the mirrors and the towers, it’s so hot that their wings melt and they fall to the ground. At Ivanpah, over 140 deaths of a variety of birds have been documented, including hummingbirds, owls, hawks, and pelicans. Parabolic troughs like the Genesis Solar Plant pose less threat to birds than power towers, as the superheated areas are much smaller. However, the troughs look like bodies of water to birds, shimmering in the heat and reflecting the blue sky. As the birds swoop down, they get caught in the ultra-heated areas. At the Genesis plant, there are 31 documented cases of bird deaths, though mostly from undetermined causes. Animal rights groups have raised concerns about this issue and in 2014, researchers from the National Fish and Wildlife Forensics Laboratory submitted a report to the California Energy Commission on bird deaths at local CSP plants (see link above). What does the future hold for large-scale solar? The Genesis Solar Power Plant has been plagued by a string of bad decisions and poor press. Many feel that both native land rights, as well as animal well-being have been ignored because renewable energy is seen as being of greater value to society than native wildlife and cultural inheritance. These issues though are by no means intrinsic to CSP or renewable energy in general. It could’ve happened no matter what structure was built at the site. With proper planning and research, a CSP project in the area could be quite successful. Let it be a lesson for us moving forward that, although solar and renewable energy contributes to the greater good, we must still be aware of how it immediately affects the people and the environment around us.